This time it’s a Knit Red KAL! 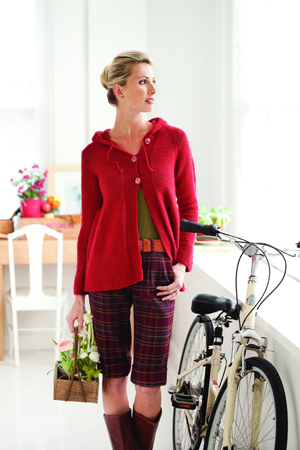 We will be knitting Diane Soucy’s Knitting Pure & Simple pattern from the Knit Red book, the A-Line Hoodie. We chose this pattern not only because it is one of our favorite patterns from the book (although I think they are all favorites!) it also has the highest number of favorites on Ravelry of any of the Knit Red patterns! The KAL will start on Monday August 6th and run for 6 weeks until Monday September 17th – this is all happening online at the Jimmy Beans Wool blog. Click here if you are interested in learning more or participating.